Who doesn’t love a new bag? The Trifecta bag sewing pattern has lots of options and make great gifts for family and friends! 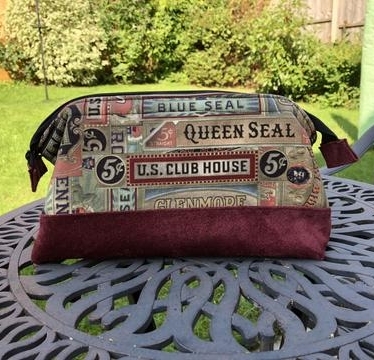 The Trifecta Zip Bag sewing aptterns features 6 different sized bags so you can make gorgeous toiletry, make-up, pencil or essential oils bags using the smaller sizes, or use the larger size to make a stylish handbag. This pattern pack makes bags easy to make and is a step you from Emmaline’s Retreat Bag pattern. This pattern has several more options such as accented top and bottom pieces, and handbag straps. The instructions are provided to put the straps on the largest size of each set, but why not add them to al the sizes! This bag sewing pattern is suitable for advanced beginners. Each bag has an A-frame shape, wide at the bottom and tapering in at the top and opens wide and includes two 2 internal slip pockets. Each bag requires a pair of internal wire frames (thee are not included) but can be bought from Emmaline too. With great digital drawings and full size pattern pieces for all shaped pieces plus cutting instructions to cut handbag straps. Pattern instructions are in both imperial & metric which is always very useful.